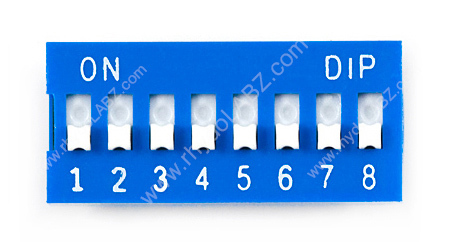 Description: DIP switch with 8 individual switch positions. The pins have .1"(2.54mm) spacing - fits great into a breadboard! Works great as general control switches. Full Name Email Address Please enter result of 9+4 ? Found this item with same quality and at a lower price but prefer to buy from rhydoLABZ.com? Please submit the url of the better price you saw. We will lauch an immediate investigation and try our best to beat the price, if it proves to be the same product. We will notify you the result by email. Thanks a lot for helping us to maintain competitive prices.